What can you tell us about bull kelp? and many other marine subjects. 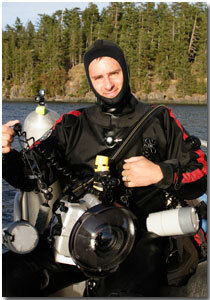 He has a degree in marine biology from the University of California, Santa Barbara. Br>He as worked with the National Park Service, the University of California, and the Australian Institute of Marine Science. Now he explores one of the planet’s last frontiers, the world beneath the waves. and the icy waters of British Columbia and Alaska. He lives in land-locked Spokane, WA, USA with his artist wife Melissa who is the diver swimming with the giant Pacific octopus in the book Amazing British Columbia. Here is the book I read for information on kelp. _____(2000). "Kelp" in Encyclopedia of British Columbia. Daniel Francis (Ed.) p. 378. So what can you share about bull kelp? Do you have a photo of bull kelp? A story about bull kelp? An interesting bull kelp fact that would amaze others? Enter Your Title. Include the words "Bull Kelp" if you can.